Handsome Jack Thorndyke has more than once held Kitty's adoring gaze. As he prepares his gleaming threshing engine for its winter work, he finally asks her to be his chosen Harvest Nell when the last of the golden Lincolnshire corn is cut. Carried away be her excitement, Kitty fails to heed the warnings whispered into her ear. Jack is far from the marrying kind. Worse still, his playful charm has attracted another - a young girl far above his station. Will Kitty's dreams be scattered like chaff upon the wind? Or can she hold on to a very special kind of love: a love which will bring both heartache and joy to the Manor in the turbulent decades to come? 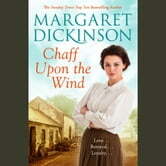 Set in the epic years before and after the First World War, Chaff Upon The Wind, Margaret Dickinson's novel of Lincolnshire life, is a spellbinding story of courage, loyalty and love.